On Saturday October 1st 2011 at the Clare Roots Genealogy and Family History Conference, historian Liam Curran delivered what was to me a fascinating presentation on ‘The Irish Soldier in the British Army in the First World War’. Liam presented an account of the horrors of war that featured real people, including members of his own family, who lived and loved not far from where I now live; real people who died in the most horrific of circumstances – sons, brothers, uncles, fathers. During that presentation we saw a very famous painting entitled ‘The Last Absolution of the Munsters’ by the war artist, Matania. Most if not all the men depicted here are from Munster. The priest on horseback who gave a general absolution to these men was Francis Gleeson, one of 13 children from Templemore, Co Tipperary. On the extreme right is Regimental Sergeant Major John Ring born in Bandon. Also, there are many men from Clare. The second mounted figure is 40-year old Colonel Victor Rickard, husband of Louise Moore from Mitchelstown, Co. Cork, whose father founded the Cork Historical and Archaeological Society and was a Protestant Home Ruler. She herself wrote articles for the Cork Examiner Newspaper. 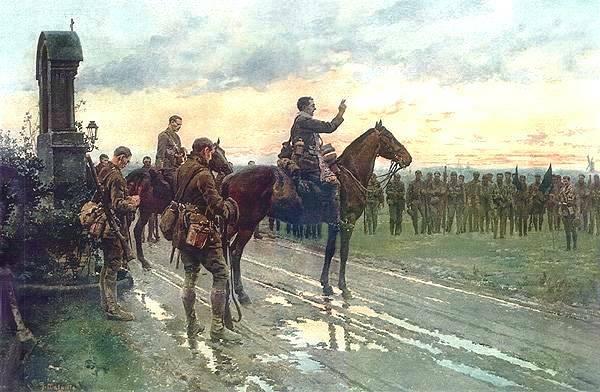 At dawn on 9th May, just hours after the general absolution, these Irish men came out of their trenches. Within hours, 151 of them lay dead, including the Commanding Officer Rickard, and 16 men from Clare. Just one of a number of Irish Regiments, the Munster Fusiliers consisted in the main of Munster men – mainly from Clare, Kerry, Cork and Tipperary. They fought and died in their hundreds in various areas of conflict during their long history including Afghanistan 1839, Burma 1852, The Crimea, the Boer War. It is reckoned that about a quarter of a million Irish men were involved in the First World War. They endured the horror of the killing fields of the Western Front, often cold and often hungry, surrounded by the stench of death, hearing the screams of the dying, with rats eating their feet. They were slaughtered, drowned and maimed in Gallipoli and in many places whose names they could not pronounce. 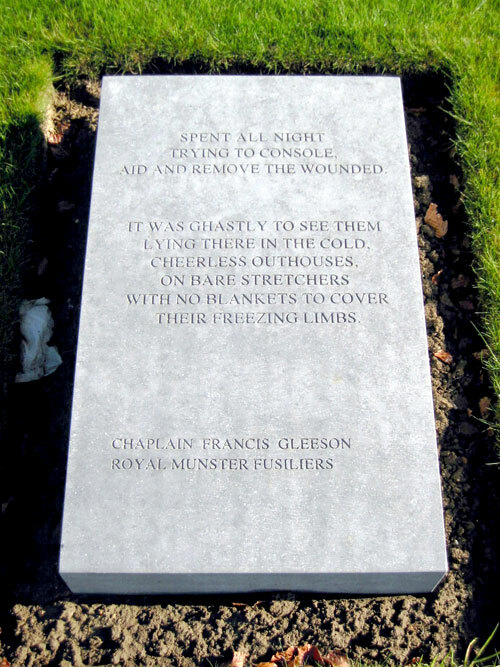 Text from Fr Gleeson’s Diary entry 10 May 1915 as inscribed at the Messines Irish Peace Park. Growing up and educated in Ireland in the 1960s, I was never aware of the tens of thousands of our countrymen who fought and died in horrific conditions in many theatres of war down the centuries. These people had effectively been wiped from the history that we were taught in schools, wiped from our national memory, wiped from our very DNA. The truth is that most were volunteers. The truth is that, fired up by calls by Irish Nationalists like John Redmond, who claimed that ‘Ireland’s highest interests’ lay ‘in the speedy and overwhelming victory of England and the Allies’ they volunteered in their droves; the truth is that many went because they needed the money for their families; the truth is that many went because they belonged to large families with low-income and it would be one less mouth to feed. Undoubtedly some also went in search of adventure and perhaps also to escape issues at home. The First World War was the war in which most Irish lives were lost and in which the Irish performed amazing acts of courage and bravery. However, when the survivors returned they were shunned and met with hostility and even physical violence. The honour with which they had departed was in stark contrast to the changed circumstances when they returned. Ireland had staged an uprising against British rule at Easter 1916 and the Ireland to which they returned was one with a new sense of nationalism and a different set of values. We in Ireland have come a long way in redressing the airbrushing of our past. President Mary Robinson was the first Irish President to wear a poppy on November 11th each year and President McAleese has kept up her predecessor’s practice of attending the Remembrance Sunday services in St Patrick’s Cathedral in Dublin. President Mary McAleese also stood shoulder to shoulder with the Queen of England at the opening of the Island of Ireland Peace Park in Mesen (Messines) Belgium on 11 November 1998. We still, however, have a way to go. 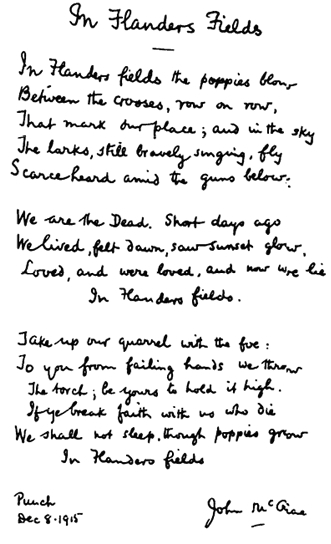 In Flanders Fields – the iconic poem by John McCrae, MD, (1872 – 1918) Canadian Army. I will proudly wear a red poppy on 11 November 2011 to honour all Claremen, all Munster men, all Irishmen who made the ultimate sacrifice. Fr. Gleeson volunteered for a second time and returned to parish work in Dublin where he died in 1959. He is buried in Castlelough, Co Tipperary. Added November 2013: Fr Gleeson is in fact buried in Glasnevin Cemetery Dublin. See here. There is another Fr Gleeson, also a chaplain who is interred at Castlelough, Co Tipperary. Sgt Major John Ring served for 5 years in France and repeatedly refused promotion to stay with his battalion. He retired to Limerick and died in 1960. He is buried in Mount St Lawrence Cemetery. 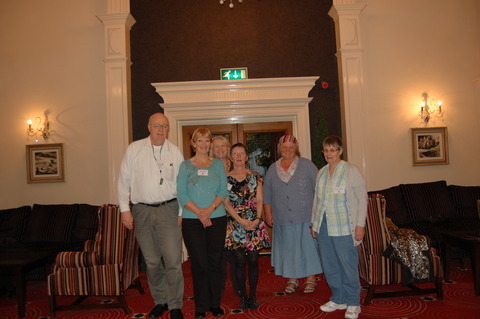 Clare Roots Society recently hosted a Genealogy and Family History Conference in Ennis, Co Clare with the theme ‘The Future of our Past’. The audience included attendees from Switzerland, the United States of America, New Zealand, Australia and the UK, as well as Irish from far and near. 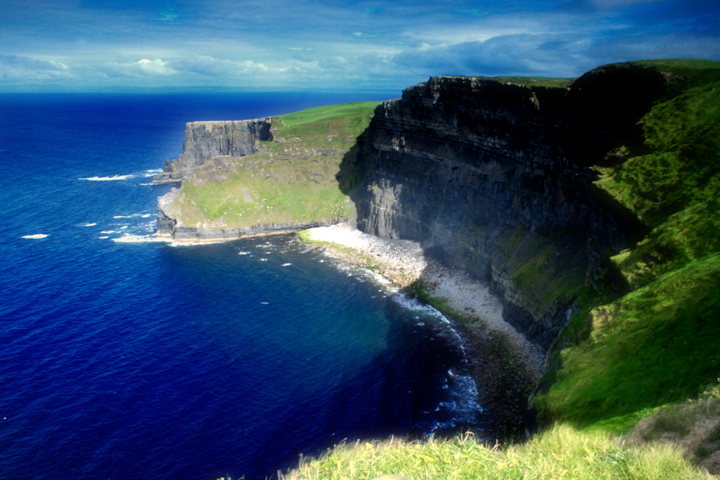 Clare Roots Society is an Ennis based amateur family history, genealogy and heritage group in County Clare. Established in 2006, it has members at home and overseas, many of the latter being actively involved in transcribing historical records, thereby making family research so much easier for researchers.Among their varied activities they have organized the recording of graveyard inscriptions, some school rolls, parish records and that most unique of Irish records,mortuary cards. In addition they organize workshops and lectures and work closely with Clare County Library, which in turn is host to a myriad resources and is a model for every county library in Ireland. The ‘Future of Our Past’ experience was a first for me, who dabbles in Family History. It was with some trepidation that I headed off to Ennis one wet Saturday morning in October. Not being from Clare, and the only known tenuous connection with the county being that my father’s cousin’s husband was stationed at Loop Head Lighthouse as a keeper some decades ago, only added to my lack of confidence! Soon after arriving I had made contact with a some fascinating and interesting people from a Yahoo Genealogy Group to which I subscribe – from USA and Australia as well as Dublin and Sligo, and there too as one of the conference speakers was Dr Jane Lyons , owner of the website From Ireland who also established the Yahoo group Y-IRL. Apart from the pleasure of meeting new people, the conference itself was a terrific success. Although tailored for Clare, the lectures were of a general nature and were filled with useful information for a novice like me. The topics ranged from a very poignant account of Irish men who fought in the First World War, delivered by Liam Curran, to Gregory O Connor from the National Archives who demonstrated the often fascinating and quirky wealth of information held in legal and court documents. We heard about the notorious Black & Tans from Jim Herlihy who was followed by Jane Lyons telling us about the importance of graveyards and encouraging us to document the inscriptions before they wear away. After lunch, Antoinette O’Brien from the Corofin based Heritage Centre gave an animated account of the records held by that centre and Dr Nick Barrett, of ‘ Who Do You Think You Are?’ TV fame led us on an excursion into the world of family history as portrayed in the media. Finally the renowned John Grenham from the Irish Times Irish Ancestors website gave useful pointers and assessments for the resources that are available for anyone looking up their past in Ireland. He also posed an interesting question about information now on computers – emails are now used and not letters; much valuable social history is shared on social networking sites; How might researchers in the future access this information or will it all be lost forever? The entire series of lectures is available on DVD from Clare Roots at very reasonable cost. I heartily recommend it to anyone who has an interest in looking into the past, whether for research, just for fun or on a serious mission to find who your ancestors are. Clare Roots Society staged a wonderfully successful and professional conference, with a list of speakers second to none. Congratulations and thanks are due to them and we look forward to the next one! Filed under Ancestry, Family History, Genealogy, Ireland, Irish Diaspora, Irish Heritage, Irish History, Who do you think you are ?